Over the course of the past ten days or so, a French Tumblr account named Gluten Free Museum has been getting quite a bit of attention. The concept takes famous works of art, popular cartoons and movies, and iconic photographs and Photoshops them to strip them of all things wheat and gluten. The gimmick has been covered everywhere from Health to Bustle to HuffingtonPost to Slate to Vox. And the long list could go on. Before you spend too much time scouring my version for the differences between the gluten-filled and gluten-free versions of the art, here’s the spoiler: there isn’t any difference. They look exactly the same. And that’s where the huge error in the Gluten Free Museum is. Removing wheat and gluten from famous works of art, movies, cartoons, photographs, and other aspects of pop culture assumes that the gluten-free life is one of omission, absence, subtraction, something missing. It is, as that writer put it, a “sad gluten-free life” devoid of the things that make life life. But that’s not true at all. The gluten-free life is a delicious and satisfying one of presence, alternatives, substitution. The bowl of spaghetti isn’t gone. It’s still a bowl of spaghetti, except the pasta is made with brown rice or maybe quinoa instead of durum wheat. The donut. The baguette. The pizza crust. The bagel. The cake. The cookie. They all have gluten-free analogs. Those foods don’t disappear from our lives. Instead, the ingredients with which we make them are simply different. In the end, the thing that’s most “museum” about the gluten-less art of the Gluten Free Museum is its horribly antiquated and hackneyed stereotype that the gluten-free life is missing the stuff of life, when in fact nothing could be further from the truth. I completely agree with you. Gluten free and gluten-full foods should look exactly the same, they’ll just be made with different base ingredients. No person eating gluten free should feel like they have to omit any food item from their diet, just switch up the ingredients! Oh, and I just have to point this out………I find it hilarious that the first Lady and the Tramp “Gluten Free Museum” pic minus the gluten only addressed one of the “gluten-y” items in the pic, the pasta, while completely ignoring the bread sticks on the table. I laughed SO hard when I saw that. I’d say the lenses through which they view things as “gluten free” are incredibly distorted! Bravo, Pete!!!! Thank you so much for this post! I totally agree and am off to share with everyone! I love the way you think! We are so deeply attached to wheat that, yeah, I suppose my first thoughts were only about deprivation, but then there are wonderful folks (YOU two!!!) to help us get past that kind of thinking and the doors to delicious alternatives are opened wide. Yep, saw the bread sticks first thing, too. THANK YOU Peter. I felt exactly the same as you when I saw the pictures from the campaign a few weeks ago, that they were so depressing and made it seem like we live the GF life devoid of any pleasure from eating. Thank you also for your most recent cookbook of family favorites…it’s really helped to get our kids back into the kitchen with me. First, I don’t know who’s behind it and their intentions in doing so. Were they aiming to skewer the GF lifestyle? If they were, it comes off fairly subtle when there are far more direct ways of doing it (think Jimmy Kimmel, or the NASCAR Super Bowl ad). This GFM project strikes me as something that a celiac/NCGI might have come up with, perhaps a newly DXed one who’s struggling with their new normal and trying to capture this struggle in a concrete and creative way. Art being so subjective, and absent of any statement from the artist, one can often read all sorts of things into it. So the message the GFM sends might depend on the person receiving it. There’s also the matter that little of the “before” art shows people who are particularly enjoying themselves because of their glutenful lifestyle. 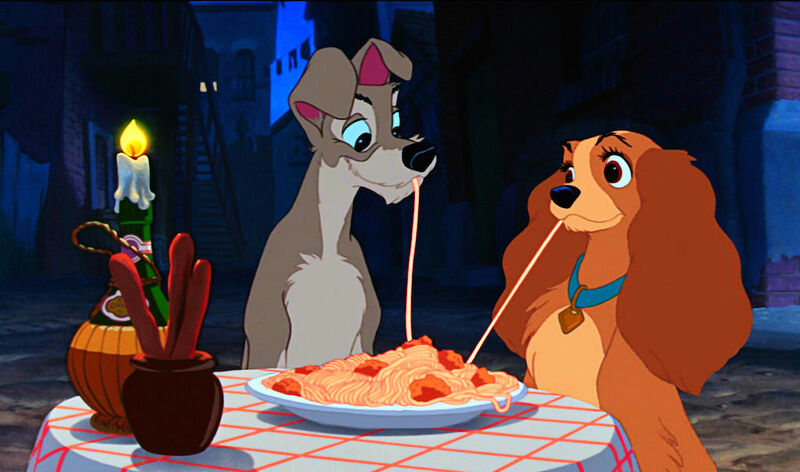 Some of the works don’t even feature people (or anthropomorphic animals a la Lady and the Tramp). In those that do, the people aren’t always eating, and even in those where they are, some of them seem to doing so in a rather perfunctory manner (a la Chief Wiggum) as opposed to undertaking a decadent experience. In fact, I’m kind of reminded of an elaborate (and fair warning, rather NSFW) Louis CK stand-up routine about Cinnabon, where at one point he says (paraphrase from memory), “No one is *happy* in the lineup at Cinnabon,” i.e., they’re feeling guilty/ashamed about how willing they are to wait in a lineup to buy such unhealthy food (which btw also happens to have gluten in it). If this GFM “curator” were trying to portray the GF life as an ipso facto sad one, the works of arts chosen for re-creation were IMHO rather poor examples to make the point. It’s also worth noting that in some cases it isn’t always just non-GF food getting removed in these photoshops, but also cross-contaminated implements for handling non-GF foods. This is shown most effectively in Grant Wood’s American Gothic where no food at all has been removed (there’s none present in the first place!) but the farmer is suddenly sans pitchfork. While there is currently fairly good awareness of GF, the cross-contamination angle is often poorly if at all understood. If the GFM could reach the broader population to create a dialogue on this matter, there could actually be a positive takeaway here. In full disclosure, I myself don’t care a whole lot for the non-GF versions of the foods identified in this post: pizza, baguettes, doughnuts, etc. I try to focus on foods in their own right that are naturally GF as opposed to ersatz non-GF versions of these others. So perhaps this is partly why I don’t find the GFM all that bothersome. Some of those foods, for me, especially doughnuts, were never much part of the pre-DX picture anyway. A video called “How to Become Gluten Intolerant (Funny)” uploaded to youtube last month has gotten 3M+ views. It makes a quick acknowledgement of genuine GI at the start but unravels from there. What I found particularly egregious about this video was how it lumped lactose intolerance together with GI in a mocking way, when the truth is, it’s not at all uncommon for celiacs to have concurrent LI depending on their degree of villous atrophy. The video makes this LI concurrence looks like just another aspect of the faddist side of the GF diet. It’s probably one of the most mean-spirited things I’ve ever seen in this nascent gluten-clowning genre of “comedy”. It’s as though the video is going out of its way to tell outright lies just for sake of being (or rather trying to be) funny. This other example is more local to me: a radio ad from a sports bar in my area. With the Stanley Cup Playoffs having started last week, this particular bar touts itself in the ad as the place to be to enjoy all the games. It opens with this bit of dialogue: “Where are you watching the playoffs this year? Dave’s place? Dave, who only serves gluten-free vegan snacks? Come on!” Then it goes into the sales pitch of how great the bar is, etc. (b) that, because there’s always the counterargument that they’re only targeting the faddists, it’s on YOU to “prove” that you’re NOT one of these faddists. There’s a gratuitous “us vs them” sort of framing going on here that seeks to create hostile divisions. The GFM on the other hand doesn’t give me this vibe at all. I get your point about its portrayal of the GF lifestyle as a life of omission but this to me isn’t all that damaging a message, partly because we don’t fully know the intentions behind it, and I don’t sense any hostility from it. It can be read in different ways, not all of them negative, as I’ve argued. Frankly, I’m more concerned about other more hostile, damaging kinds of GF messages that unfortunately seem rather fashionable lately. I don’t care whether people feel sorry for me and my “life of omission”. But I do care about people taking my dietary restrictions — for which I never even asked — seriously. Love how far gluten free living has come. In the beginning, you could definitely tell the difference between gf and flour cooking. Now, thankfully, not so much!